CONSTRUCTION group Melati Ehsan Holdings Bhd plans to bid for government contracts under the 10th Malaysia Plan (10MP) to grow its business. The 10MP, a five-year economic development plan which runs from 2011 to 2015, is set to be unveiled in June this year. 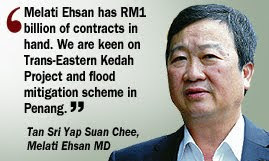 Melati Ehsan has RM1 billion of contracts in hand, of which more than half are government projects. These include the construction of the Trans-Eastern Kedah Interland Highway Project and the flood mitigation scheme at Bertam-Kepala Batas in Penang. The group's net profit fell by a third to RM12.7 million for its financial year ended August 31 2009 due to fewer construction activities and higher raw material prices. Revenue also dropped to RM178 million against RM208.5 million previously. About 60 per cent of its turnover comes from government projects. The company is also vying for private development projects, especially from multinational companies. It has completed two Carrefour hypermarkets, one each in Kota Damansara and Cheras. "Since we have a track record with Carrefour, we are looking forward for more projects with the hypermarket operator in future," managing director Tan Sri Yap Suan Chee said at the group's annual general meeting in Kuala Lumpur yesterday. It also has 120 acres of land in Kota Damansara and recently acquired land in Bukit Tunku. It bought 1.6 acre of land in Bukit Tunku for RM16.36 million in August last year and plans to develop bungalow lots next year. Yap said the company is looking to buy more land in the Klang Valley with about RM80 million cash in hand.